Dark Pit charging the Silver Bow in Super Smash Bros. for Wii U. Silver Bow (神弓シルバーリップ, God Bow Silver Lip) is Dark Pit's neutral special move. Dark Pit will fire a dark arrow. Silver Bow does not have as long a range as its counterpart and cannot be curved as much, but it has a slightly faster traveling speed, deals 1% more damage when uncharged and 2% more damage when fully charged, and possesses slightly higher knockback. Its range can be increased by fully charging it, similar to Pit's version. "Fire an arrow of darkness. Stronger than Pit's arrows, but they don't curve as much." "Fire a giant arrow that travels through foes. A powerful shot, but leaves you quite open." "Fire a mystical arrow that can be easily controlled but is slower and less powerful." Piercing Bow: Shots take longer to charge and cannot be controlled in the air, but they can pierce through opponents. They are also stronger: damage rises by 3-6% for Pit and 5-8% for Dark Pit. Guiding Bow: Shots are weaker and slower (down by 1-2% for Pit and .5-1% for Dark Pit), but they can be more easily controlled. In Super Smash Bros. for Wii U, this variation is a Challenge unlock for Dark Pit, only obtainable by using Dark Pit to get a score of at least 25 in Rival Smash. The Silver Bow as it appears in Uprising. The Silver Bow appears in Kid Icarus: Uprising as a usable weapon. It is always Dark Pit's weapon as a non-playable character during land stages, starting with the final boss fight against him in Chapter 6. Dark Pit's use of the Silver Bow to fire dark arrows, which the weapon did not do in Uprising, may be a reference to Dark Pit's appearances in flight stages in that game, namely the ones in Chapter 6 and Chapter 9. 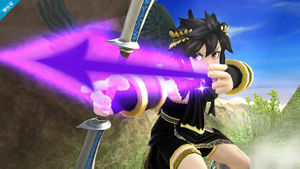 During those stages, Dark Pit wielded a First Blade, Pit's default weapon in Uprising and the most basic type of Blade; however, Dark Pit's version fired shots of darkness, unlike the player's version firing light shots. Dark Pit and Pit using their bows alongside each other at Mario and Luigi. Challenge board unlock image for Guiding Bow. Mewtwo dodges Dark Pit's arrow. Dark Pit using Silver Bow as shown by a Skill Preview in Ultimate. If Kirby copies Silver Bow and uses the move at the end of his forward, back, or up throw, he will float in the air until he stops charging the move. This was fixed in version 1.0.5 for the 3DS. In Kid Icarus: Uprising, the Silver Bow fires green bolts of light, but in SSB4 it fires black and purple colored arrows, possibly to be in line with Dark Pit's "dark" motif and to be an antithesis to Pit's light-colored arrows. The arrows themselves seem to be based on the ones shot by the Darkness Bow or from Skuttlers, as they share a similar coloration. Ironically, the description for the Silver Bow in Kid Icarus: Uprising specifically emphasizes the bow’s high fire rate and homing capabilities, while the version in Smash has low speed and little maneuverability. This page was last edited on April 20, 2019, at 19:01.